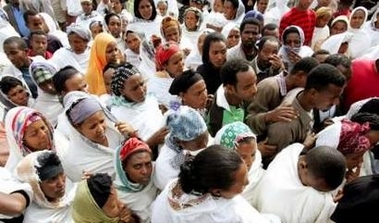 Thousands of Ethiopians gather at Emanuel Church to mourn those lost in the violence this week in Addis Ababa. 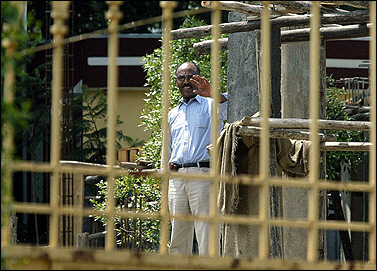 Opposition Leader, Hailu Shewal, Coalition for Unity and Democracy Opposition Leader, speaks to reporters from behind a barrier. He was placed on house arrest this week after the violence that left at least 27 dead in Addis Ababa on Wednesday. CUD deputy chairman Berhanu Nega was stopped at the airport on Friday while trying to leave for London on a fund-raising trip. More than a dozen other CUD members also remain in police custody. Information Minister Bereket Simon said CUD leaders had rejected a deal agreed on Friday which called on the opposition and the ruling party not to incite violence and to support the work of the electoral commission. 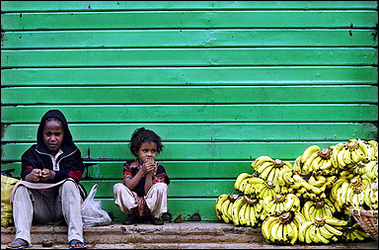 Two young banana sellers at a Addis Ababa market. The market shops in certain parts of the city are still closed in a protest strike. And, the Carter Center came out with a post election report on June 9th. The center had given the initial election a glowing review but after the violence of the post election and accusations of fraud the center toned down its final report. See if you can find the outrageous remark in this report (via Young Ethiopian Diasporans). I’ll give you a hint… it’s highlighted! The Carter Center joins other members of the international community and Ethiopian citizens in expressing its deep alarm and sorrow at the violence, injuries, deaths, and violations of human rights that have occurred since 6 June in Addis Ababa and elsewhere in Ethiopia in the aftermath of the 15 May national elections. Carter Center observers have been witness to and received reports of acts of violence that appear to be the result of a lack of restraint on the part of some government security forces. The Center calls upon the government to take immediate steps to curb the extreme measures employed by the security forces, which have led to multiple deaths. Update: Glenn Reynolds, the Instapundit is continuing to follow this historic election and aftermath.